Today we are pleased to announce that a new version of Cubiquity for Unity3D has been released on the asset store. Version 1.2 brings performance and memory gains, adds support for 64-bit architectures, includes faster transfer of mesh data from the native library, and provides experimental heightmap import. Our new example map shows a city modeled at a resolution of 512x512x64 voxels which can be destroyed in real-time (complete with physics). Data courtesy of William Rigby and the game ‘Build&Shoot’). We have improved both performance and memory usage by introducing an octree to reduce the number of mesh chunks which are active at an given time. We’ve combined this with a sophisticated time-stamping system, which allows us to minimize the amount of work required to synchronize our internal representation with Unity’s scene hierarchy. 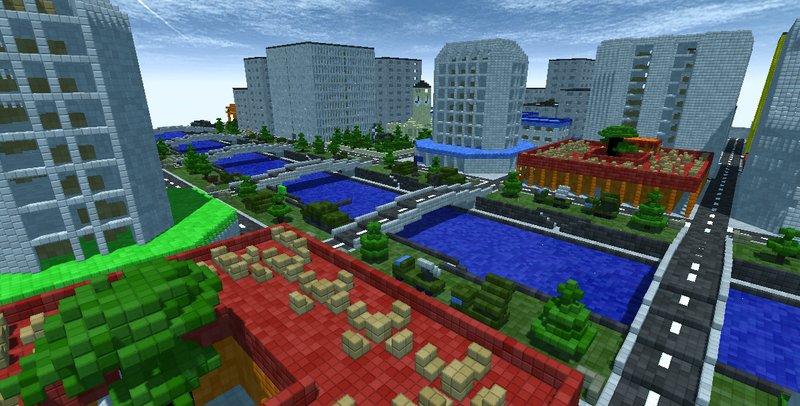 The city map shown above loads in just a few seconds and runs smoothly with destruction and physics enabled. We have also replaced our ‘ConvertToVDB’ and ‘ConvertToImages’ tools with a single general purpose tool called ‘ProcessVDB’. This provides experimental support for importing heightmaps as terrain volumes – experimental in the sense that it seems to work well but needs some refinements to the workflow. 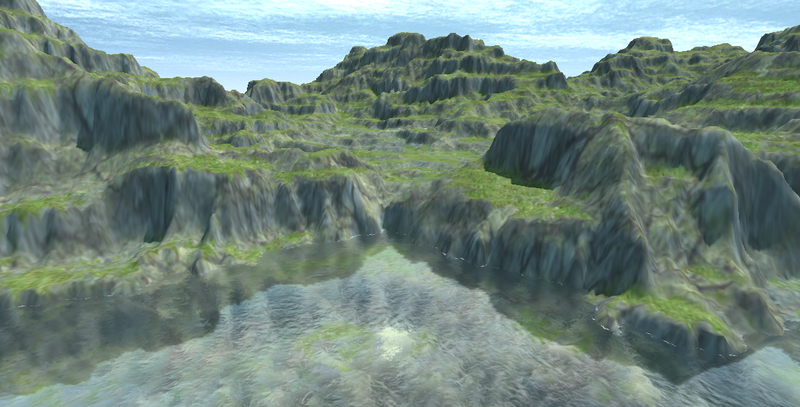 This map was created using the new functionality to import from a heightmap. Once in the editor the usual sculpting tools can be applied to create caves and overhangs, or to apply materials and textures. For those of you who are waiting on the integration with Unreal Engine 4, I spent some time with Matt over Christmas and saw that the system is indeed progressing nicely. Both the smooth terrain and ‘colored cubes’ volumes are largely working though integrating with the editor and blueprint system is a lot of work. We both have only limited time so there’s not currently a set schedule for the initial release, but keep an eye on the forum thread for the latest updates. As you might have seen if you’re following us on Twitter, I’ve been working hard recently to get Cubiquity working with Unreal Engine 4. Both David and I have long been fans of the Unreal games and the engine and so I’m having great fun diving into the code. I haven’t spend a lot of time on it yet but earlier this week I had the time to push the integration to a point where I can start showing off some features. Take a look at the video below for an overview of the current state. The aim is to have at least feature equivalence between the UE4 version and the Unity3D version. So far I have only the smooth voxel terrain working and haven’t started on the coloured cubes version yet. There is live editing in the editor preview mode but not yet integrated as an editor tool such as users might be used to after working with UE4’s heightmap terrain features but this is something I will try to get in before the first official release. For the first beta release I want to spend some time neatening up the interface to the engine to make what’s currently available as usable as possible. I’ll be posting an update here on the blog when there’s code out for people to test but in the meantime follow us on Twitter @VolumesOfFun (or me personally @milliams) or track our updates on the Unreal Engine Forums. It’s been a quiet few months, but we’re happy to say that a new version of Cubiquity has just landed on the asset store. Version 1.1.3 is primarily a bug-fix release but also adds a few new features such as normal mapping of the colored cubes volumes and an example showing how to build and save voxel databases from Unity scripts. Colored cubes can now have custom diffuse and normal maps applied. Shiny! We’ve also tidied up a lot of stuff internally, for example all of our PolyVox enhancements have been merged back into the main develop branch and we have overhauled the Cubiquity build system. Perhaps not so exciting for end users but still an important step as development can move a bit more smoothly from here on. Looking forwards, the main request has been for larger volume support and better performance with less memory. In other words, we’re going to put some work into optimization and possibly providing some tools (importers, etc.) to help create the larger environments. We’ll try not to go another three months without posting, and I think the upcoming changes should give us plenty to show off! Update 3rd Sept 2014: Version 1.1.3 is now out with collision and physics fixes for smooth terrain. The links above have been updated. Cubiquity for Unity3D is now on the Asset Store! Hi all, I’m pleased to announce that we’ve just made the first official release of Cubiquity for Unity3D, and that it’s now available to purchase from the asset store. 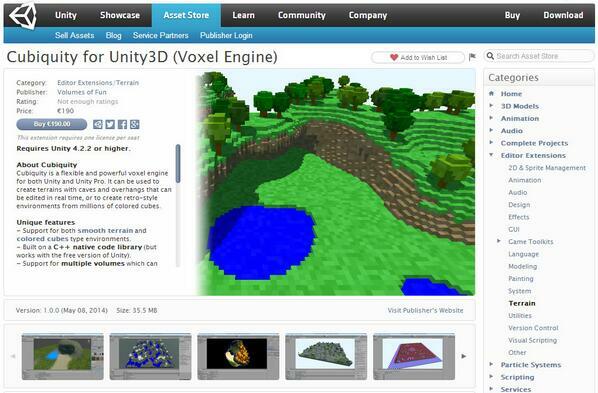 This is a huge milestone for us and comes just over a year after we first showed our work on Unity3D integration. This is really just the start of the journey for Cubiquity and we have plenty of ideas for how we want to further develop the system over the coming months. But that can wait for a future post – for now we’d just like to thank everyone who has spent time testing our system, giving feedback, and providing encouragement. You’ve helped get Cubiquity for Unity3D to where it is today! I’m pleased to announce that today we’re releasing a new snapshot of Cubiquity for Unity. This version finally adds support for both OS X and Linux, and also includes a number of smaller improvements regarding stability, user interface and documentation. One of the main appeals of Unity is the ability to target multiple platforms from a single code base, and so we’ve always been keen to bring this functionality to Cubiquity as well. The process is more complex than for other Unity assets because Cubiquity is a native code library written in C++, and so it needs to be compiled (by us) for each platform which we want users to be able to target. We haven’t added any significant new features beyond the improved platform support, but there has been more work on polishing the API and particularly on documenting it. The final release will naturally include API docs and a user manual to get you up to speed quickly, but we’re also hoping the API will be simple enough to be intuitive. We currently expect that this is that last snapshot which we release before we put Cubiquity on the Asset Store! The end is now really in sight and we hope to be live by the end of this month. 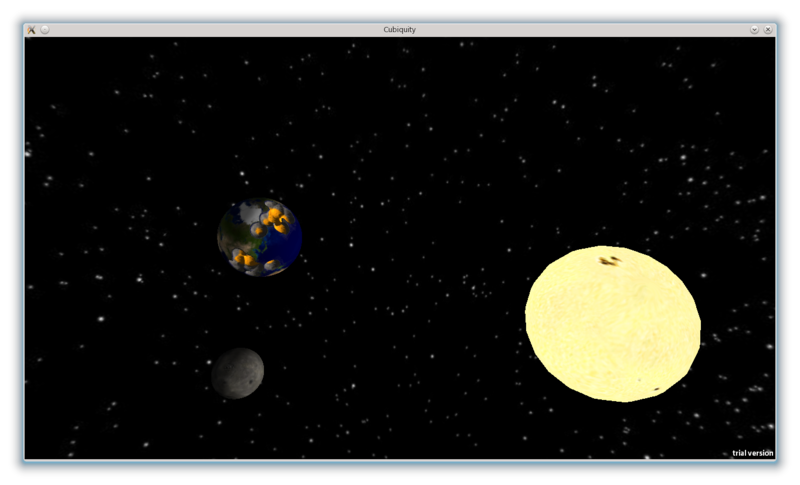 Well it’s taken me a few weeks of on and off work but I’ve got Cubiquity working on Linux as a Unity3D add-on. You can try it right now from the Git repository and as long as everything works correctly, it will be available in the next official release. There are two essential parts to Cubiquity: the core Cubiquity code where all the magic happens and a thin wrapper providing a C interface to allow easy interaction with Unity’s C♯ code. Cubiquity builds heavily upon PolyVox which has been working on Linux for years now so at least we had a good base to work from. Like PolyVox, Cubiquity is written in C++ which makes it easily portable meaning I had to only make a few trivial changes to the code to get it to build. After a few tweaks to the CMake files, we had a libCubiquityC.so file built and ready. In order to ease installation and avoid library mismatches, we decided that statically linking all that we could was the best option. Luckily, Cubiquity has few 3rd-party dependencies — in fact it only depends on the C++ standard library and two small Boost libraries. Boost was only being used to fill in features which are now part of C++11 and so by increasing our compiler requirement we could remove the Boost usage entirely. Once here it was simple enough to statically link in libstdc++ and avoid and difficult dynamic library requirements. 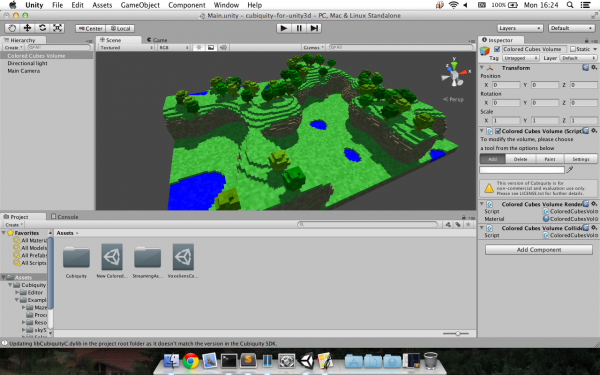 For testing purposes, David sent me a simple Unity application which had been exported for Linux and used Cubiquity to create a simple terrain. The idea was that I should be able to place the libCubiquityC.so alongside the executable and the Mono runtime would find the library and load the appropriate stuff from inside it. With a bit of tweaking of the C♯ loading script and recompiling the library as 32-bit (because the Unity app I was using was 32-bit) I was able to run the Unity application and have it render a terrain. As you can see in that last link, the terrain was not rendering properly and so David set to work getting the shaders working correctly and fighting with some tricky Unity bugs and now it all seems to be working well. Getting Cubiquity working on Linux, as well as being an end in itself, is a useful step towards getting it running on OS X. We are compiling it with both GCC and Clang (which is the OS X compiler) to make sure the code stays portable. In the medium-term we’re working towards being able to easily build the library for all our supported platforms from one place and so I’ve been investigating cross-compiling from Linux to both Windows and OS X. I will give a more detailed description of what I’m doing in a future post but we do already have DLLs and DYLIBs building and they are undergoing testing at the moment. Once we’re confident in the Linux build, we will work on testing out OS X support. As well as transforms, the video also shows that the material system is much more flexible now. You can still use the TriplanarTexturing material but it’s really just an example. The ‘planet’ material (used for the Earth in the video above) shows how textures can be applied from a cube map, and we have ideas for other approaches too. Actually setting the material is also more natural now. We’ve introduced ‘VolumeRenderer’ and ‘VolumeCollider’ components which are conceptually similar to their mesh-based cousins, and so the material can be set just by changing the ‘material’ property of the ‘VolumeRenderer’ component. There’s still some work to do with these but it’s starting to take shape. Sounds great, but when is the release?! We were originally hoping to be on the asset store by the end of last year, and we’re clearly behind in that regard. This isn’t due to any particular problem or road block – it’s just a case of everything taking a bit longer than expected. But that’s why we put out these snapshots, so that you guys can see the progress and start playing with the system. As it currently stands, we expect to put out one more snapshot in about a month, and then release at least the free version of Cubiquity on the asset store about a month after that. It’s not clear if the paid version will go live at the same time – we may have a testing period with just the free version available. At any rate the paid version won’t be very far behind. Volume wrap modes (out-of-bounds voxel access can now clamp, repeat, border, etc). Improved error handling and logging system, and also timers for performance analysis. Pluggable compression and paging support for the LargeVolume class. None the less, with Cubiquity in the foreground we want to ensure PolyVox does not stagnate, and this Christmas has provided chance for Matt and I to sit down and discuss how to achieve this. It has become increasingly clear to me that the effort involved in developing a mature open source project is significantly greater than developing a young private project. For example, within Cubiquity I will routinely add, delete, rename, or refactor large swathes of code, safe in the knowledge that I am the only person affected, and that I can roll back large architectural changes without having to justify it to anybody. In principle PolyVox should be the same – the license clearly states that it’s provided ‘as is’. But in practice there is at least some degree of moral obligation to consider backwards compatibility, communicate significant changes, update the documentation, update the language bindings, test on multiple compilers, etc. This adds a degree of inertia to the project which reduces enthusiasm for making changes, especially in light of having less free time than was previously available. 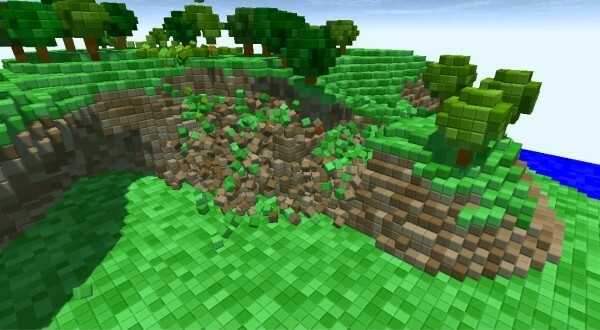 Stop worrying (too much) about API stability: I recently added support for wrap modes and bounds checks when accessing voxels outside of the volume, but this would have changed the interface to the ‘getVoxelAt()’ functions. Therefore I left these functions as they were and added new ‘getVoxel()’ functions. It’s technically backwards compatible, but is also confusing, error-prone, and adds more code to test. In the future we’ll just change things when we feel they need to change. Embrace C++11 and drop support for older compilers: Matt has long been an advocate of embracing C++11 within PolyVox, and previously we said it would be used after the next stable release. Instead we will start using it now wherever we feel it makes sense. This will result in older versions of Visual Studio being unsupported, and I would guess that VS2012 would become the required version of Windows. Cut down the amount of code in PolyVox: Some of this will come from the C++11 support – for example we can remove the Boost fallbacks and compiler detection from CMake, replace PolyVox::Array with std::array, etc. Also, the numerous volume, block, and array classes overlap too much in terms of functionality, so we will make some reductions here. We may also strip out the built-in compression code and just let users implement this with an external library. Simplify build system: We’ll probably drop support for building PolyVox as a dynamic (shared) library, as it’s really not clear that it makes sense when PolyVox is almost entirely header files. We may go header only if we decide it makes sense, as this would then remove the need for people to build PolyVox at all. Note that we are no longer planning to release a new stable version before commencing work on the above. This may have some impact on users who are trying to keep up with the latest version in Git, but practically speaking the changes are going to be spread out over many months. We’ll also try to keep the develop branch in a relatively stable state and continue to run nightly tests, etc. PolyVox is still a key piece of software for us as it provides the foundation for Cubiquity, so we do hope these changes help keep it moving forward and allow us to add some of the new features we’ve been thinking about. The download link is at the bottom of this post. Overall the system has changed quite a lot, so if you were using a previous version then you should take care when upgrading. Be sure to back up all your files so you can revert the upgrade if need be. You will have to make significant changes to your code and any old volumes you have will not be compatible with this new version. Previously Cubiquity would store all the data for a given volume in a user-specified folder, with each chunk being stored as a separate file which could be paged into or out of memory on demand. The new version instead makes use of an SQLite database to store the voxel data. It’s a lot tidier as everything is in a single file, and it should also bring performance and robustness improvements. However, the file format is not finalized yet so please don’t depend on it. Future versions of Cubiquity may not be able to load these files! This is the first snapshot to be released under our new licensing model. It’s free for non-commercial and evaluation use (see LICENSE.txt for full details) and hard-coded limitations on volume size have been removed. Practically speaking there are still technical limitations, but those will lift in the future as we optimize the system. Please note: there is currently no way to create large volumes through the user interface but you can do so through code. The ColoredCubesVolume class has been split into ColoredCubesVolume and ColoredCubesVolumeData, and a similar split has been made for the TerrainVolume. The idea is to correctly separate responsibilities. ColoredCubesVolume is a component which handles rendering, interaction, etc while ColoredCubesVolumeData is just the data it operates on and can be serialized to an asset (probably… not really tested). More splitting of responsibilities will probably occur in the future. Please look at the code for the examples discussed in the video to see how you should now construct volumes from code. Some functionality may have got lost in the refactor, in particular it is no longer possible to import a colored cubes volume from a stack of images. We plan to bring this back in the future as a separate command line tool so that we can also demonstrate the Cubiqity C API. So if you really need this functionality you might want to hold off upgrading for a while. You can download the snapshot corresponding to the video with the link below. Just extract the zip file and import the .unitypackage file into Unity. Be aware that it’s still Windows only at the moment. Today we have some very important news regarding the future licensing of Cubiquity for Unity3D, and in particular there is a change to the way that the free version can be used. Please read the information below carefully! So far we have said that there will be both free and paid versions of the system, with the free version allowing both commercial and non-commercial use but being limited in terms of features and volume size. As of today we are changing this – the free version will be for non-commercial use only but we will remove all feature and size limitations. In other words, you will now be able to get the full and unrestricted version of Cubiquity at no cost, providing that you are using it for non-commercial purposes. Even if you are using it commercially you will still be able to use the free version for evaluation purposes – i.e. you can make sure that Cubiquity is right for you before you commit to buying it on the asset store. The exact terms and conditions are available in LICENSE.txt in the Git repository. It puts the system into the hands of those who otherwise could not afford it. It generates publicity and helps promote the system. It allows users to evaluate the capabilities of the system before they commit to a purchase. It allows testing and feedback from a larger user-base which results in a better product. Basically, we feel that all of the above points are better served by the new licensing model rather than the old one. How and when does it take effect? The license file has been added to the Git repository and takes immediate effect. Over the next few days we will take steps to make sure that the new license is clearly visible, and will then raise the size restrictions which are currently in place (though technical constraints still remain). Lastly we will produce a new snapshot in the next week or two. But I preferred the old license! I’ve already started using it on a commercial project! Don’t panic, we’re not looking to catch anyone out here. If you have already started a project with Cubiquity and you were intending to commercialize it then just send us an email (support@volumesoffun.com) with a brief description of what you have done so far. We’ll acknowledge that you are working on it and you can continue to be bound by the old conditions. However, you’ll also be bound by the old limitations so do consider whether you’d rather switch to the new license for better features and bigger volumes. Ok, great, but what’s the plan for the commercial licenses? Well, we’re still working hard. Most of the features for the initial version are implemented but there is a lot of polishing to do. I think we’re still hoping to get it on the asset store by the end of the year, where the plan is to sell it as an editor extension for $200 per seat under the standard asset store license. That’s not the end of the road though, we’re still only scratching the surface of where we want to go with this system. We’re also really pleased with the feedback we have received so far so please keep spreading the word!